If, like us, you are a self-proclaimed numbers nerd, then you will love GOOD and IBM’s new site, Figures of Progress. Celebrating the use of data to innovate businesses, organizations and communities worldwide, Figures of Progress helps businesses of all sizes better understand and appreciate how to use data to improve their business or organization. It’s not always easy, and it’s definitely not always pretty, but knowing how to leverage data is quite possibly the most effective way to run your business. Sure, data can be manipulated but you can’t change a hard number. From startups like Cause.It to Fortune 5oo brands like Starbucks, data-driven businesses know how to take those oftentimes headache-inducing numbers and make them work for their businesses. Major urban cities like New York recognize the importance of using data to drive change and improve practices. 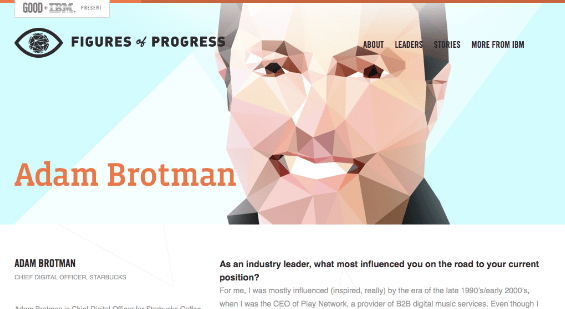 Figures of Progress features an informative Q&A with a business leader like Airbnb’s Nathan Blecharcyzk or Starbucks’ Adam Brotman weekly. There’s also a nifty Response Box on the site where you can share your thoughts on the featured interviews. The video showcasing how basketball is using data to change the game is a must-watch. So go get your numbers groove on and check out Figures of Progress, also on Facebook and Twitter.